You can use charts to present or explore the coding in your project. Charts can help you answer questions—for example, What are the dominant themes in this interview transcript? or How is coding spread across the different demographic groups in my project? 1 View the displayed chart. Double-click on a data point to view the underlying data. 2 Switch between the Data and Format tabs on the chart options panel to change the content or appearance of the chart. 3 Export, print or expand the chart, hide the options panel and access the Help. In List View, select the file or node you want to chart. For example, select an interview transcript to see the dominant themes, or select a theme node to see how coding is distributed across demographic groups. 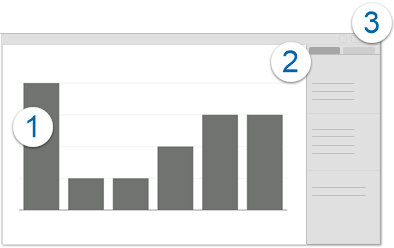 On the Explore tab, in the Visualizations group, click the Chart image. The chart is generated and displayed in Detail View. You can use the chart options panel (on the right) to change the data displayed in the chart, or to change the chart's format and appearance. What can I display in a chart? Coding for a file Shows coding information for a particular file. You can see which nodes are most used to code a file—for example, the file Competing water uses is most coded by the node Economy. You can also see how much coding is done on a file. Coding for a node Shows how a particular node is used in coding files. This can help you see which files are most or least coded at a node—for example, the node Habitat has more coding references from the file Interview with Barbara than from any other file. Coding by attribute value for a node Shows how coding at a node is distributed across one or two attribute values. This can help you see which demographic groups have most coding at a node—for example, residents from Riverside have spoken out the most about flood control.